1:00:03: Visual: Footage of an African American man moving a large box from a moving truck into a housing project building in South Boston. Marcus Jones reports that two African American families moved into a South Boston housing project today. 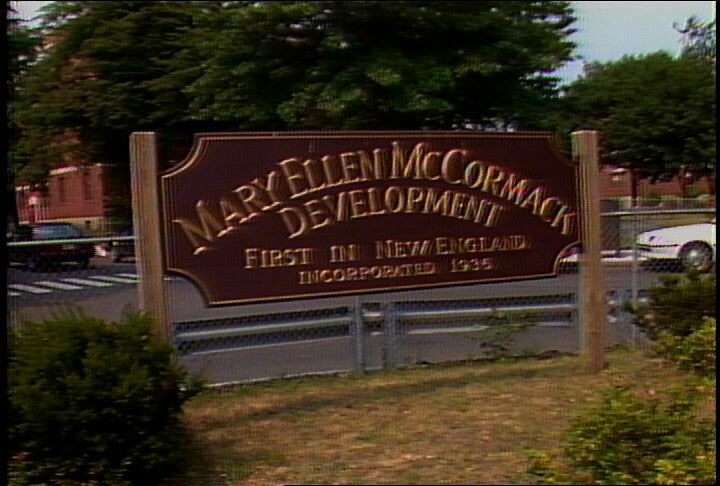 V: Shots of white residents outside of the McCormack Housing Development; of a sign for the Mary Ellen McCormack Housing Development. Jones reports that an African American family last lived in the development ten years ago; that the family left because they claim to have been harassed by white residents. V: Shots of a moving truck outside of a project building. Police and movers stand near the truck. Jones reports that police officers in uniform and in plain clothes were present at the housing project today. V: Footage of an African American mover saying that he has had no trouble at the housing project today; that white residents have offered him refreshments while he did his work. Shots of the movers moving a couch from the moving truck into the project building. Two green shamrocks are posted above the entrance. Jones reports that the two African American families were on the emergency placement list; that they were placed at the project because they had no other place to go. Jones notes that opposition to the mayor's desegregation plan for public housing is growing among whites and African Americans. 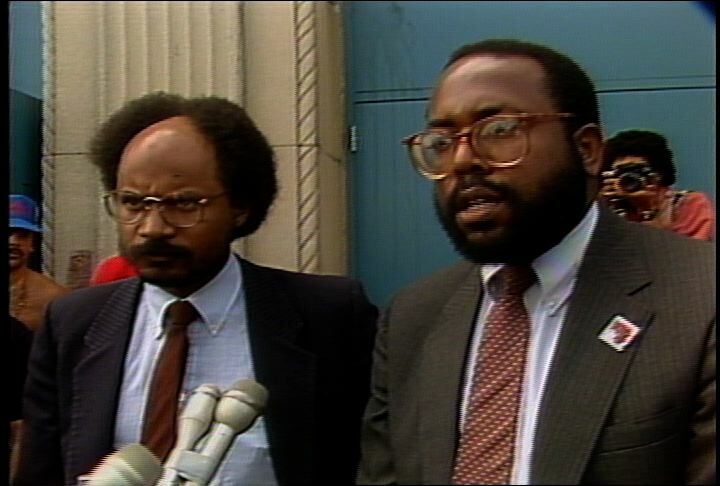 V: Shot of Jones and Carl Haith (President, Boston chapter of the NAACP) entering an office from a dark hallway. Footage of Haith saying that the city should not have to identify African Americans to enter an-all white housing project. Shot of the exterior of the NAACP offices in Roxbury. Jones reports that the NAACP has filed a lawsuit to block the city's desegregation plan. Jones notes that the NAACP believes the plan to be unfair because it ignores groups which may have been discriminated against before 1983. V: Shots of NAACP employees and volunteers in the NAACP offices. 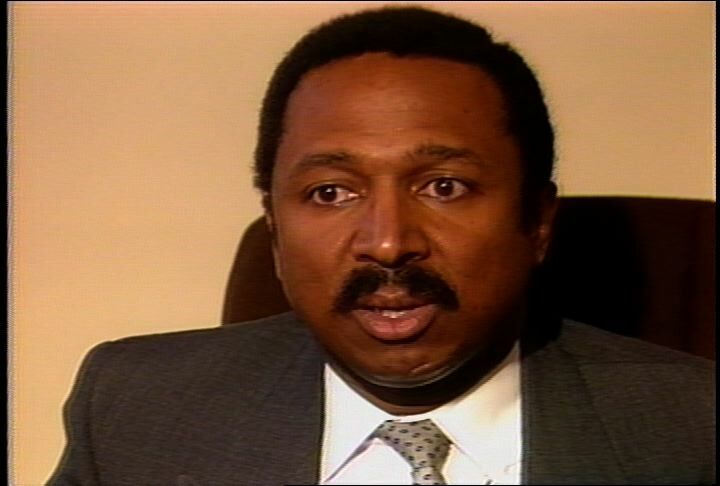 Footage of Haith saying that the city claims to be unable to identify victims of discrimination before 1983. Haith says that the city should try to identify those victims and compensate them. 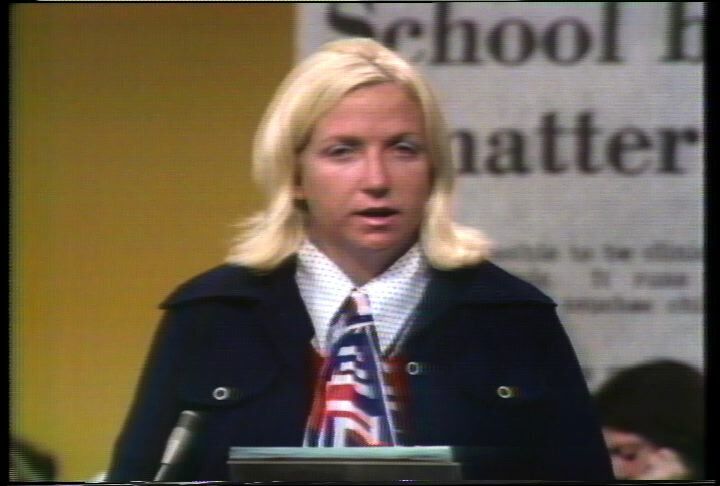 Jones reports that the Boston Housing Authority claims that many applications filed before 1983 were lost when the city switched to a new computer system. V: Shots of white residents standing at the entrance to a housing project building in South Boston; of a white woman looking out of the window of a project apartment; of a housing project in South Boston. Jones reports that the BHA says that it will investigate the claims of those who claim to have been discriminated against before 1983. V: Shots of African American movers at the McCormack Housing development. Jones stands in front of the NAACP offices in Roxbury. 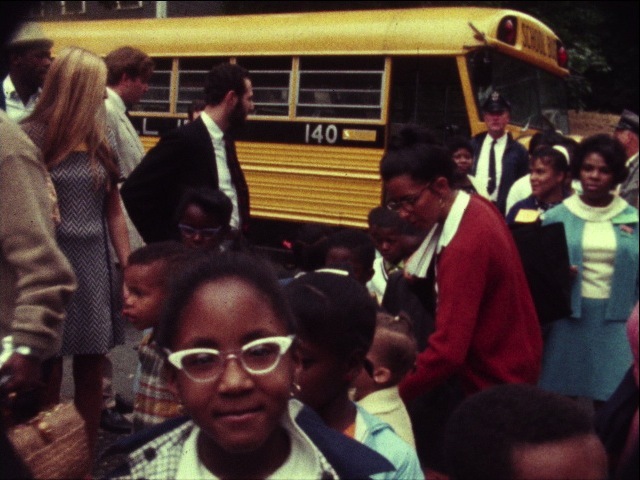 Jones reports that the NAACP led the fight to desegregate public schools in Boston; that the city had probably expected the NAACP to support its plan to desegregate public housing. Jones reports that the NAACP does not think the city's plan does enough. Description: Outside South Boston High School. Buses arrive. Mostly black students exit school and board buses. Police cruisers and motorcycles stationed in front of school. Interview with headmaster Jerome Wynegar who says despite some trouble and a severe lack of students, classes will go on, and faculty will try to keep up morale. He says “…kids come here to learn, believe it or not.” Several takes of reporter standup. 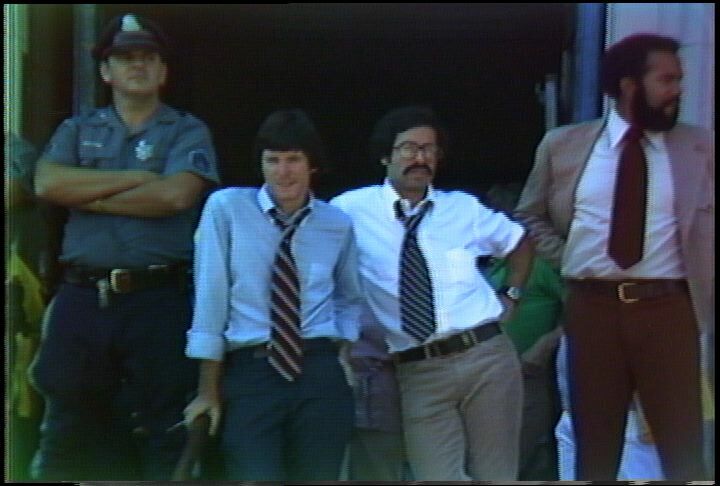 Description: Commissioner Robert DiGrazia, Boston police and US marshals stationed outside South Boston High. Black students exit school, get on bus. Buses slowly come and go. Many officials mill about on sidewalk. Headmaster Jerome Wynegar talks to Joseph Jordan. Later, white students flow out of school en masse. Comments, some racist, from the crowd waiting outside the school can be overheard. Description: Hope Kelly reports on charges of racism against the Boston Irish Rowing Club. Larry Otway, President of St. Brendan's Rowing Club of New York said that he was discouraged from bringing African American rowers to compete against the Boston Irish Rowing Club in South Boston. Otway later rescinded his accusations. Mayor Ray Flynn holds a press conference to cite progress in fighting racism across the city. Flynn, William Geary, the Commissioner of the Metropolitan District Commission, City Councilor Bruce Bolling, John Joyce, the President of Boston Irish Rowing Club, and Otway speak at the press conference. Joyce denies any discriminatory practices on the part of the Boston Irish Rowing Club. Andrew Jones and Curtis David of the Greater Roxbury Incorporation Project hold a rival press conference in front of the L Street Bath House in South Boston, spekaing out against racism Jerry Cullitary (South Boston resident) defends South Boston against charges of racism. Interview with Susan Moir, a South Boston resident, about racism in South Boston. People rowing in curraghs on Pleasure Bay. 1:00:00: Visual: Footage of Andrew Jones (Greater Roxbury Incorporation Project) and Curtis Davis (Greater Roxbury Incorporation Project) at a press conference in front of the L Street Bathhouse in South Boston. Jones reads a prepared statement. The statement reads that Ray Flynn (Mayor of Boston) should not invite New York residents to Boston; that African Americans from New York and Boston are not welcome in Flynn's neighborhood. 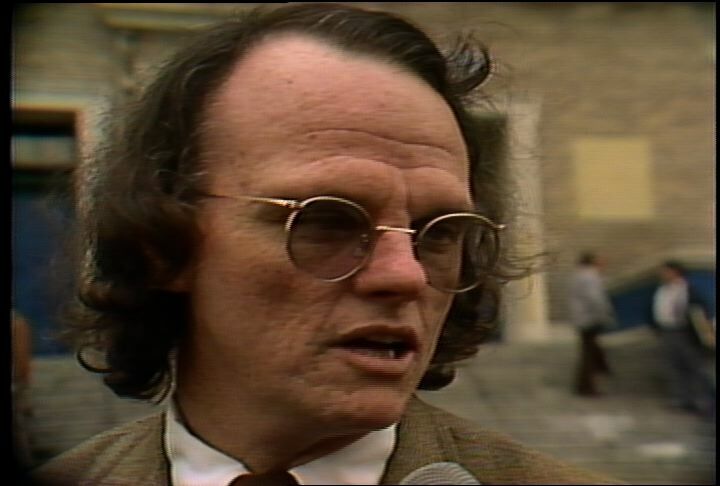 Footage of Flynn at a press conference. Flynn says that acts of discrimination in the city will not be tolerated. Shots of Davis and Jones at their press conference; of Bruce Bolling (Boston City Council) speaking at Flynn's press conference. Footage of Jones saying that African Americans were stoned when they tried to visit Carson Beach in 1974. Footage of William Geary (Commissioner, Metropolitan District Commission) at Flynn's press conference. Geary says that Carson Beach is open to all citizens. Shots of Flynn speaking at his press conference. White and African American city officials stand behind him. Hope Kelly says that Flynn's press conference included a full array of testimony about the city's progress in fighting racism; that it is rare for African American community leaders to hold press conferences in South Boston. V: Shot of the press conference in front of the L Street Bathhouse. The sign over the entrance to the bathhouse reads, "James Michael Curley Recreation Center." A crowd of white residents and media stand in front of the entrance. Shot of a white man standing at the entrance of the bathhouse. Footage of Jones saying that Flynn is doing nothing to combat racism in his own neighborhood. Footage of Flynn saying that a number of minority youngsters have participated in events in South Boston. Footage of John Joyce (President, Boston Irish Rowing Club) saying that the rowing club does not discriminate; that their activities are open to all. Kelly reports that Joyce directs a group of rowers who row on Pleasure Bay in curraghs; that curraghs are boats which are native to Ireland. Kelly notes that the club competes against other curragh clubs; that the club will host a New York curragh club on Sunday. V: Shot of Joyce in a curragh; of rowers in curraghs on Pleasure Bay; of white male members of the club on shore; of a white male getting into a boat with two other white rowers. Shots of curragh races. Kelly reports that Larry Otway (President, St. Brendan Rowing Club of New York) filed a complaint against the Boston club; that the Otway contends that Joyce told the New York club not to come to Boston with African American rowers. V: Shot of Joyce at Flynn's press conference. Kelly notes that Joyce apologized; that Otway has now exonerated Joyce. V: Footage of Otway at Flynn's press conference. Otway says that Joyce is not a racist; that Joyce has always welcomed all of the members of the New York Club; that Joyce has been mistakenly targeted as a racist. Kelly reports that some people agree that the rowing club has been unfairly targeted as racist. Footage of Jerry Cullitary (L Street bather) saying that the residents of South Boston are hard-working, working-class people; that racism is more of a problem in the white suburbs than it is in South Boston. Kelly reports that South Boston has become synonymous with racism. V: Shot of a front page headline in the Boston Herald. The headline reads, "Southie rowing club beached by racial uproar." Footage of a white man addressing Jones and Davis at the press conference at the bathhouse. The man says that "good news in South Boston is no news; that bad news is big news." Davis says that he has not heard anyone utter a racial slur at the press conference. The man says that he would like Davis and Boyce to talk about "good news" in South Boston. Kelly says that the press conferences pointed up the stereotypes which still exist on both sides of the race issue in Boston; that the "sunny side-up" tone of Flynn's press conference only reinforced skepticism about the issue. V: Shot of Flynn leaving his press conference. Hope Kelly stands in the room where Flynn's press conference was held. Kelly said that she wanted to ask Flynn if Carson Beach was presently open to everyone; that Flynn did not answer the question. 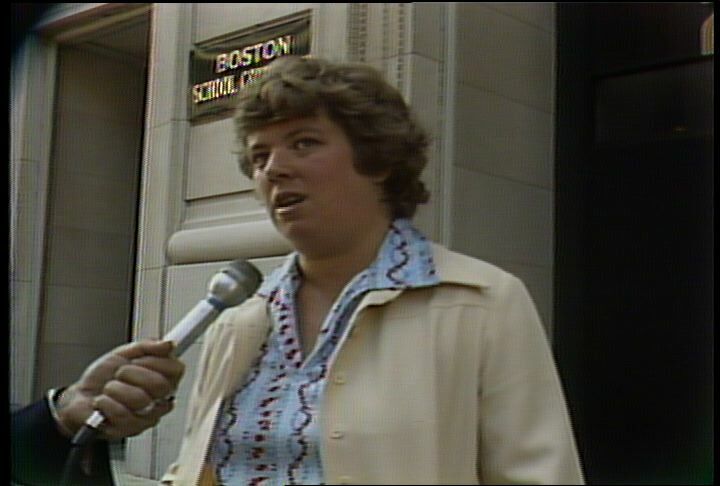 V: Footage of Susan Moir (white South Boston resident) in South Boston. Moir says that her son is white; that he gets insulted at Carson Beach because he has dark skin. Moir adds that she has brought African American children to the beach with her; that the children have been hassled by white beachgoers. Moyer says that non-white people cannot use the beach. 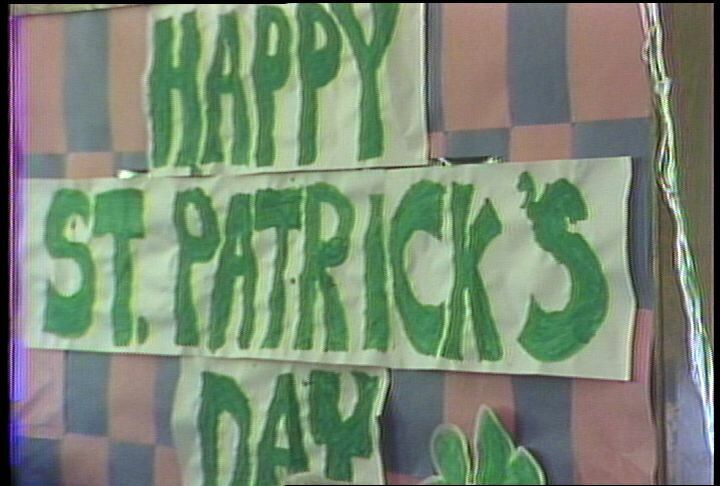 Description: St. Patrick's Day Lunch at Boys and Girls Club of Boston in South Boston. State Senator William Bulger speaks to the audience and tells jokes. 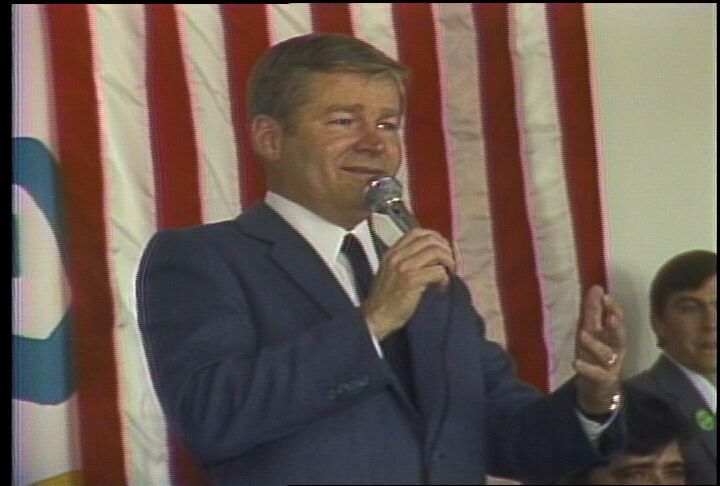 Bulger sings Irish ballad "The Wearing of the Green." Tom McGee is on stage. Description: Ray Flynn, William Bulger, Thomas McGee, Joseph Casper, Jim Kelly, and Mike Flannery at Annual Saint Patrick's Day Lunch at the Boys and Girls Club of Boston, in South Boston. People eating at tables. People speaking to the crowd, telling anecdotes and jokes, and discussing drug and alcohol problems in South Boston. Description: South Boston High exterior on first day of school. Press photographers stand around outside waiting for something to happen. Three upperclassmen say it is quieter inside since desegregation furor has died down, and learning can take place. They discuss news programs in the school. Several takes of reporter standup. Graffiti “stop forced busing” still visible on street. School bus arrives, lets off two black girls. Interview in front of School Committee headquarters with woman from Citywide Education Coalition who appraises current state of Boston schools: parents are involved and important to educational improvement; vocational education is woefully lacking; must upgrade reading and basic skills. “City can someday have an attractive and credible public school system.” She cautions that just because it is quiet now compared to the first years of busing, people should not assume the school system is okay; it still needs criticism and community input. Editor's note: Content given off the record was edited out of this footage.